A local invention will soon get its chance to shine in the national spotlight. 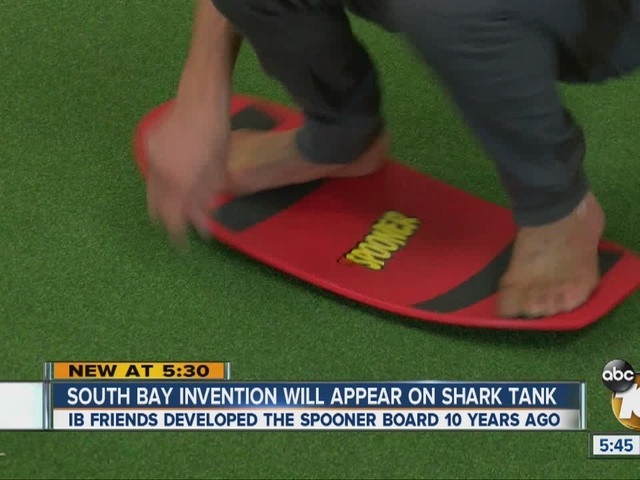 The makers of National City-based Spooner Boards are set to appear on ABC's "Shark Tank" on May 6. The Spooner Board is a curved plastic balance board that a user can ride like a skateboard without wheels on multiple surfaces. Imperial Beach resident Randy Putland accidentally cut the first board out of a plastic dog igloo in 2006. His friend, Bernie Miller, immediately went nuts. "I see it and I go, 'Rand-o!' I go, 'Man, this is the next Hula-Hoop! Man we [have to] figure out how to make it!'" recalled Miller. The men perfected a design and material, and they were selling Spooner Boards around San Diego County by 2008. In 2010, the crew moved to a warehouse in National City, where they continued to build the Spooner Boards today. "We've sold almost a half-a-million of them right?" Miller asked Putland. The two recruited a young man, Reuben Guymer, to help promote the product. "We ship right here from San Diego. Everything is 100 percent made in the U.S.A.," said Guymer. Miller said they got on "Shark Tank" by being themselves. "You start out wild," he said. "And then you get wilder. You gotta be creative because if you're not different, you just blend in." While their appearance airs on May 6, Putland and Miller wouldn't say if any of the billionaire businesspeople bit at their boards.